Don’t just remember the Alamo. There’s so much to see, do, eat and explore in San Antonio. 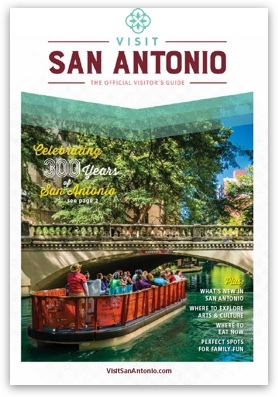 From our UNESCO World Heritage Site Missions, thrilling theme parks, modern attractions, festive events and emerging culinary scene, San Antonio has it all. Experience a taste of the city with cultural performances, live music, culinary delights, hands-on activities and more. Enjoy a sneak peek of The Witte Museum’s newest exhibit, Planet Pioneers, appearances from some of SeaWorld & Aquatica San Antonio’s animal friends, salt art from Rob the Original, live mural painting from Adrian de la Cruz and a special appearance from the Spurs Coyote on Sunday! Come and discover what’s new in San Antonio at Barton Creek Square. Join us at Barton Creek Square! Saturday, February 23rd: 11 a.m. – 6 p.m.
Sunday, February 24th: Noon – 5 p.m.
Get out of this world with The Witte Museum! Experience what's new at SeaWorld & Aquatica San Antonio! Enjoy a special appearance from the Spurs Coyote on Sunday! San Antonio is bursting with fresh new attractions for visitors of all ages, a dynamic art scene and one-of-a-kind chef-driven culinary experiences coupled with history and heritage around every corner. Come and experience the new energy and excitement that awaits you in San Antonio. Explore along the Mission Reach to experience Texas’ only World Heritage Site, the Spanish colonial missions. Let the thrills of theme parks take your next adventure to new levels with seasonal rides at Six Flags Fiesta Texas, SeaWorld San Antonio, Morgan’s Wonderland and more. Visit rotating and regular exhibits at various museums. Or, pack a picnic and take in the blooming beauty of our great outdoors. San Antonio is the perfect spot for spring break with the family or a romantic getaway!